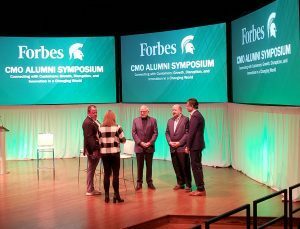 Eli Broad College of Business alums brought back to campus their most telling insights about a marketing landscape in a state of flux at the Forbes CMO Alumni Symposium on Nov. 2 at the Wharton Center. The day-long event, themed “Connecting with Customers: Growth, Disruption, and Innovation in a Changing World” and co-hosted by the Broad College and the College of Communication Arts and Sciences,” featured chief marketing officers and other brand experts from a range of companies across the nation, all with Spartan roots. This reunion of sorts of CMO alums “is important for MSU, the Broad College, the marketing department, and their various constituents in that it is representative of our mission of creating and disseminating knowledge through collaborative relationships while developing transformational business/marketing leaders who make business happen,” said Douglas E. Hughes, chairperson of the Department of Marketing and the United Shore Faculty Fellow in Sales Leadership at the Eli Broad College of Business. A common theme was the dramatic changes in how consumers link to companies and content that were being driven by digital technology. 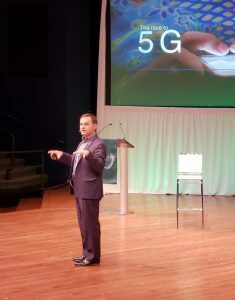 But new procedures don’t necessarily mean abandoning old principles: “What I found in my career is that while marketing tactics are changing faster than ever before, the principles and strategies of brand-building aren’t changing,” Costello said. 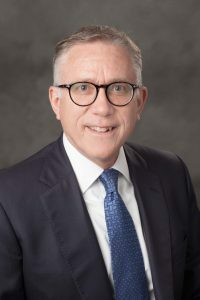 Jay Spenchian (BA General Business Administration ’81, MBA ’82), senior vice president of marketing at U.S. Cellular, said new media like streaming video has displaced traditional vendors like radio and billboards among a younger demographic. Andy Royston (MBA ’89), global chief marketing officer of the Kerry Group, said even the oldest and most necessary economic sectors are not immune to changes. Like the food industry, which is facing changing consumer tastes, needs, and expectations. “It’s no different in food. Everyone’s got to eat, so everybody thinks the food industry is very stable. But it’s just the opposite,” said Royston, adding that a “food revolution” was underway. For today’s student, all this means preparing for a future of ongoing change, said Tamara Steffens (BA Marketing ’85), GM of business development for Microsoft and president of the Broad College Marketing Leadership Advisory Board.